The Soberanes Fire burns in Monterey County (June 30, 2016). 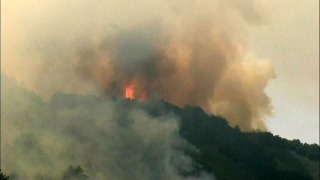 California's biggest wildfire expanded overnight to more than 104 square miles north of scenic Big Sur. An army of more than 5,000 firefighters and an air force of tankers and helicopters made progress, however, surrounding 50 percent of the nearly three-week old fire. A wildland fire burning since last month in Monterey County climbed by more than 6,000 acres between Monday night and Tuesday morning, according to Cal Fire. The Soberanes Fire north of Big Sur has extended to 67,092 acres and is heading south toward Big Sur Creek and Double Cone, Cal Fire officials said. The blaze began July 22 with an illegal campfire at Garrapata State Park and investigators are looking to speak with anyone who saw something in the area, Cal Fire officials said. There are 4,815 firefighters working to extinguish the blaze burning through steep, rugged land — with help from 267 engines, 57 dozers, 54 water tenders, 18 helicopters, six air tankers, and more. The fire is 50 percent contained, with full containment estimated by Aug. 31, Cal Fire officials said. Carmel-by-the-Sea and other communities north of the fire are expected to experience moderate levels of smoke Tuesday, while Big Sur and Carmel Valley are likely to experience unhealthy amounts of smoke, according to Cal Fire. A private contractor, 35-year-old Fresno County resident Robert Oliver Reagan III, died battling the fire when he was operating a bulldozer that overturned on him two weeks ago, according to Cal Fire. The fire has also led to three injuries that weren't considered life-threatening, agency officials said. Evacuation orders have been issued for 461 residents east of Highway 1 from Coast Road at Bixby Bridge to Coast Ridge Road, fire officials said. An evacuation center has been set up at All Saints' Day School at 8060 Carmel Valley Road in Carmel-by-the-Sea, according to Cal Fire. Many residents have been warned of possible evacuations in an area including Cachagua Road from Nason to Trampa Canyon roads and Tassajara Road from Carmel Valley Road to the Tassajara Hot Springs Zen Center, according to Cal Fire. As of Tuesday, the number of structures threatened by the blaze has decreased from 2,000 to 410. The flames have destroyed 57 homes and 11 outbuildings, Cal Fire officials said. Three structures and two outbuildings have also been damaged by the blaze, according to Cal Fire. The area remains under a state of emergency issued by the governor four days after the fire started, Cal Fire officials said. 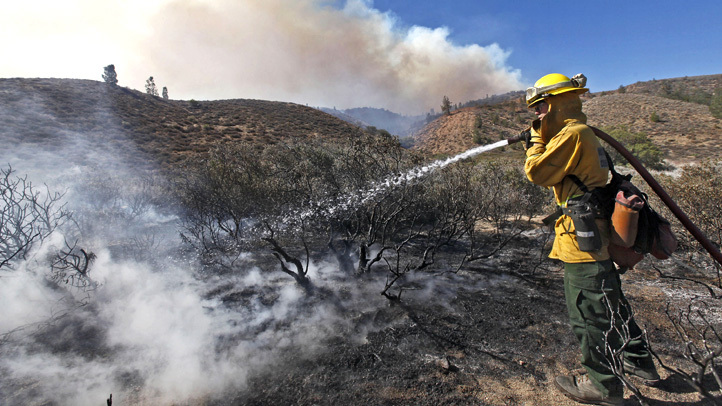 Closures are in effect at trails and roads at Los Padres National Forest and state parks in the area, according to Cal Fire. Anyone with information regarding the cause of the fire is asked to call the Cal Fire tip line at (800) 468-4408. NBC Bay Area's Rhea Mahbubani and The Associated Press contributed to this report.